I like the Buyids: a small dynasty originally from Iranian plateau that ruled Iran and Iraq, or at least parts of the territory, between the 10th and the 11th century. They produced finely made metalwork and beautiful silks, among other things. In their art as well as in their ruling style, they pursued the Iranian tradition, like many other dynasties in the region, during the so-called Iranian intermezzo. Their graffiti are quite good indicators of their own idea of power and their self-representation. Quite a lot of Buyid inscriptions, or better graffiti, are to be found in Sasanian-related places, such as Persepolis. Actually the city had been the capital of the Achemenid empire, with Darius the Great (r. 522-486 BCE) having his palace built there. Darius moved the capital of his empire in the city that became the centre of the Achemenid power, needless to say. 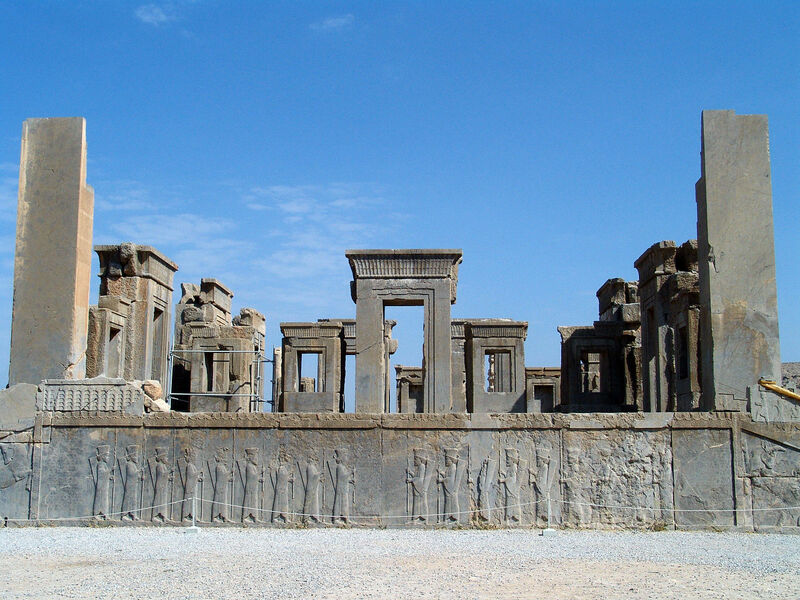 Afterwards, Persepolis was burned and looted by Alexander the Great and his army in 330 BCE during his conquest of Persia. Persepolis, anyhow, remained in the Iranian tradition, of course as sacred place, a place related to the ancient Persian Empire. It is interesting to note that the Sasanian themselves in a sense revered the place, so much so, that a couple of graffiti dated to the 4th century CE commemorate the visit of the site by a Sasanian governor and, after more or less 40 years of two dignitaries. The site was thus deeply related to Persian tradition: capital of the Acheminid empire first, it was still revered nearly one millennium later by the Sasanians. The Buyids, representing themselves as natural heir of the Iranian, and in particular Sasanian tradition, added their own graffiti to the previous ones, to trace an ideological link with their presumed ancestors. ‘Adud al-Dawla is considered to be maybe the most important ruler of the Buyid dynasty: the dynasty’s apogee begins and ends with his reign: 337-372/949-983 (Busse 1975). Even if he and his court followed Islam, thus the ideally unified religious and secular power (din wa-dawla), his idea of ruling was based on a strong division of power between the caliph, standing for the religious power, and his monarchy, the political power. The idea was actually borrowed from the Persian tradition. Following his Persian self-representation, ‘Adud al-Dawla not only visited Persepolis, but also recorded his visit in the rock, adding commemorative graffiti to the ones already made during the Achemenid and Sasanian periods. Buyid graffiti in Persepolis and other equally meaningful sites can be read on various levels, of course. Here I would like to concentrate on the story the first graffito carved on the wall of Darius’s palace tells us: what happened in Persepolis in Safar 344/June 955.
from Karaj, and Marasfand, the priest from Kazarun. What we read here is that the amir did not only pay a visit to the site, but actually brought with him people that could read (the priest) and translate (the scribe) the ancient inscriptions. As for the scribe, little can be said. The priest, Marasfand, is more interesting on a cultural point of view: Marasfand belonged to an important Zoroastrian family that helped transcribing the Avesta under the reign of Shapur II. What we read here means that the Zoroastrian tradition was lively well after the conversion of the region to Islam. Also, even if the Buyids were Shi’i Muslim, they considered that tradition essential to a certain degree. The inscription, made to resamble much earlier inscription was actually made by ‘Adud al-Dawla to state two main ideas: on the one hand to underline his affinity with earlier Iranian dynasties, and on the other hand to set his reign in the wider framework of the Persian history. The ruins where not simply visited, but where ‘understood’ through reading the inscriptions left. A ‘cultural trip’ becomes and is the way to clearly state the ideology forming the core of his reign. S. S. Blair, The Monumental Inscriptions from early Islamic Iran and Transoxiana, Brill, Leiden 1992, pp. 32-33. H. Busse, “Iran under the Buyids”, in R. N. Frye (ed. ), The Cambridge History of Iran, Vol. 4 – The period from the Arab invasion to the Saljuqs, Cambridge University Press, Cambridge 1975, pp. 250-304.